Re: Politics, what party are you? Independant I guess. Though I dislike the idea of any party. Tulip wrote: I am a conservative how about you? I claim no political party or membership. I am just an individual that likes to call them as he sees them. I am not left, middle or right. I am not a dove or a hawk. I am just me. Well ya know something OT I also am just me. But seem to be conservative these days. Tulip wrote: Well ya know something OT I also am just me. Be what ever it is you want to be. But more importantly, just be yourself. Don't ever vote for the party. Vote for the person. I think I should start a 4th party. The Anybody But party. Anybody but what's in there! C.Hound wrote: I think I should start a 4th party. The Anybody But party. If it is against obama, count me in. C.Hound wrote: Independant I guess. Though I dislike the idea of any party. Привет Бир Добро пожаловать на мой форум! C.Hound wrote: Привет Бир Добро пожаловать на мой форум! Wow! Oh my God! When you have been acquired perfect Russian to the level of native speakers? Thank you. When somebody showed me Google Translate. О чем вы говорите о Уиллис! Plus beer... Because vodka without beer is money for nothing. Oops, I forgot... Plus good snack. Or this one not bad too. I see and I know it. How can he speak in perfect Russian, if he cannot even speak English yet. No. 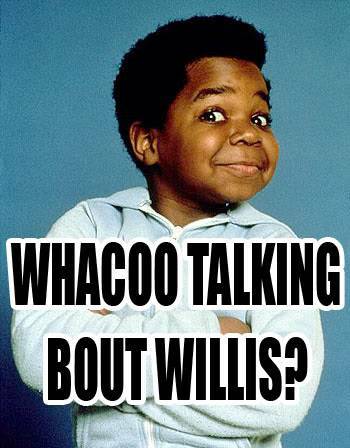 That's... Whacoo talkin' bout willis!